Part 4 - Terms and conditions when renting a property in Prague. Basic Czech rules and laws related to renting a flat or a house. ts than the landlord. This reflects mainly the possibility of the tenant to terminate the lease without giving a reason. The landlord may terminate the lease only for reasons given in the Civil Code. Notice period is also determined by law and is at least three months. The usual security deposit is one rent for unfurnished apartments and two rents for furnished apartments. But it depends on the individual cases and each landlord may choose an individual approach. The maximum security deposit, the landlord may require (under the Civil Code) is a three months' rent including advance payments for household services and energy.  there must be mentioned the apartment equipment, the extent of its use, the method of calculating the rent and payments for energy and services relating to the dwelling or the price. The most common problem you could have when searching for an apartment. Many workers from abroad that are moving to Prague start looking for an apartment too soon. Based on many years of experience, we can say that it is useless to search for an apartment in greater advance than one month before the date of intended moving into the apartment. The owners naturally want the tenant to start paying the rent as soon as possible and are usually not willing to keep an empty apartment more then one month. Exceptions are expensive apartments (over 30 000,-CZK /1200,-EUR/ month), where this period may be longer. A few basic expresions you may need to know when looking for an apartment. You will definitely hear or read terms such as 3 +1, 2 +kk. What does it mean? Kk means kitchenette. Apartment 2 + kk means bedroom + living room with a kitchenette (a kitchen is not a separate room). 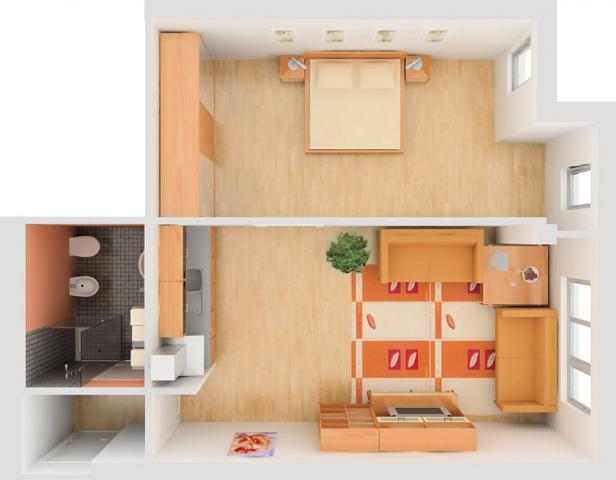 2 +1 means two rooms and a kitchen ( a separate room with a kitchen unit and a space for a dining table). The most convenient apartments for sharing are 3 +kk and 4 +kk. The most affordable apartments are 2 +1, 3 +1 or 4 +1. When searching for the right apartment for flat sharing, make sure that every room has its own separate entrance. If you find one and you are willing to fit "lounge" around the kitchen table, you save about 20% compare to more comfortable apartments with a „proper" living room. Finding an apartment with 4 separate bedrooms is not easy, the most common type is with two or three separate bedrooms. Lately, they are also popular apartments with a kitchen located in the hallway of the apartment. So sometimes even flat 2 +1 has three bedrooms, which then can give reasonably priced housing to 3 flatmates. A furnished or an unfurnished flat? This is quite a difficult question to answer, as it depends on a lot of factors. If you are looking for an apartment for only one year, most likely you will go for an apartment completely furnished. However, a sufficient offer of furnished apartments can be found only in some parts of Prague, for example Vinohrady, Zizkov, Old Town, while in others, also very attractive like Bubeneč, Letná or Hradčany) you would be quite lucky to find one. If you are looking for an apartment for more than one year, it may be good to consider renting an unfurnished apartment and furnish it according tou your personal needs. Although it means some extra money spend, you might save some money on rent and time when looking for your new place as the selection of unfurnished apartments in Prague is much bigger. If you choose this option you can, like a lot of other expats, purchase your new furniture in some of the IKEA stores, where you can find a good price / performance ratio. Searching for an apartment in Prague? Click here to see a listing of available apartments! Not enought time to search for a property by yourself ? Not familiar with a Czech legislative background and language? Not willing to spend hours searching for the right property, arranging viewings and negotiating conditions with landlords? Let our experienced agents do all the work for you! Or you can find all about our services for tenants here. Part 5 - Prices of the apartments, energies and brokerage fees.